At the heart of the Putters Edge personal putting green philosophy, has always been a strong desire to offer far more than just “adequate” golf practice solutions. In fact, the Putters Edge turf installaion system was specifically created as a proactive reaction to careless attitudes permeating the putting green industry then & even today. "What is the point of being in business if in the end the customer is not completely satisfied?" Rather than solely profit driven, the Putters Edge putting green experience expects to be an absolute joy for all involved - Enthusiastic clients are the best advertising period! At the turn of the century, I sold my benefits firm and decided to enjoy life, and golf. After about six months, I was getting antsy, looking for something new to do. A couple of members at my country club had purchased a putting green dealership and asked me to handle the sales and marketing. 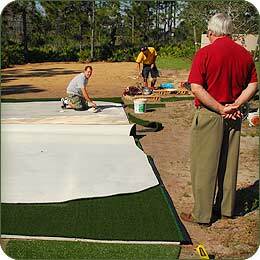 One of the first things we did was to install a 1,000 square foot putting green in my yard for people to visit. I thought I was in heaven! I could practice anytime I wanted to; it rolled true and provided numerous putting options. During the next 2-3 months we experienced typical Ohio weather consisting of heavy rains and strong winds. I noticed when putting on the green that the speed was slower in some parts of the green and faster in other sections. When I asked my partners (who had gone through training and installation courses) why it was changing, they explained to me that sand-filled polypropylene greens require regular thorough brushing with stiff bristle brooms, followed by rolling with a 400 pound water roller and even additional sand applications on occasion. WHAT? I wanted to relax and enjoy my putting green, not become a part time maintenance man! Needless to say we had a falling out. I felt the synthetic putting green business, that I was truly enjoying, had betrayed me. When I did some follow-up investigations on turfs from other companies, I found that most of them promoted the sand-filled turfs, downplaying the maintenance factor. The only other turf option was nylon turf, which required very little maintenance, but gave the ball an unrealistic wobble when putting. There were two mills manufacturing the nylon product at the time, both in Dalton, GA. After visiting with them a number of times over a four-month period, I was able to convince Grass Turf Mills that if they could eliminate the wobble, I could sell the turf. They increased the yarn count, changed the tufting procedure and through research and testing, PAR (Pure Absolute Roll) turf evolved. PAR Turf™ is now manufactured in four stimp speeds that provide the golfer a putting green that matches the speed of the greens he or she plays on. Nylon turf putting greens aren't for everyone. Since they are not filled with sand they'll not normally hold shots over ten yards. Of course, they don't provide the owner an opportunity to stay in shape with all that regular brooming, rolling & sand application, either!